"An out-of-control driver parked his red sports car halfway up a tree Sunday evening...neighbors said the driver of the Mazda RX-7 bought the car the same day...witnesses said the driver was speeding in excess of 70 mph down Woodland Way around 8 p.m. when he lost control on a curve...pictures show a slight berm, which may have helped launch the car nine feet up the tree. 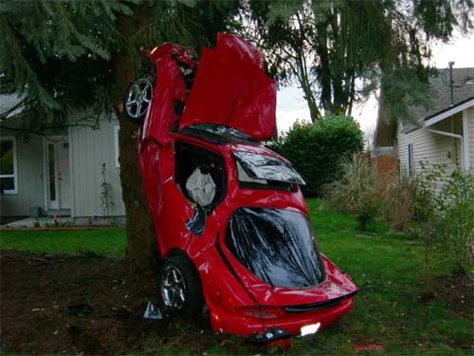 The car came to rest in a nearly vertical position against the tree. Incredibly, the driver had only minor injuries." Question Of The Day: Was The Eddie Griffin Enzo Crash A Publicity Stunt?